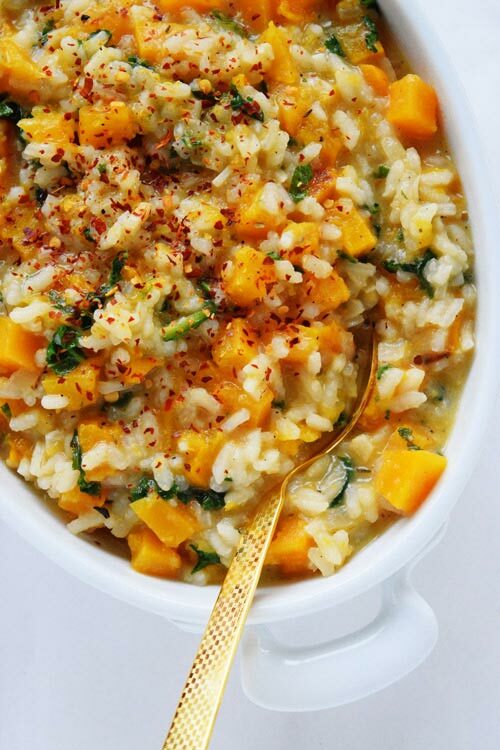 Creamy & Comforting risotto with fall veggies! This ☕ meal friends! It’s the perfect fall comfort food heaven in a bowl. Now finally it’s starting to cool down a bit here and now all I can think of is comforting bowls of my favorite meals, my favorite throw, that favorite spot on my favorite couch and my laptop! And my coffee too! All favorites ? The first ever risotto I made was this butternut squash risotto which was amazing but as you can see horribly documented. I mean who leaves only a link to a recipe without giving a proper step by step recipe?! Yes that would be me from 2013. Feels like ages have passed! But anyways since I love love eating risotto but don’t make it enough, I thought to play around with that recipe and give it some life. So here we are with fresh photos, a fresh recipe made totally from scratch and with my 2 favorite ingredients : Butternut Squash & Kale! Kale haters, WAIT!! You can replace kale by spinach or green peas or asparagus. Just endless possibilities. So before you think of closing this page down, I suggest you to calm down and read on ? Yeah Jerry gets sort of annoyed when he is stressed and the best possible reply I give him is RELAX. That drives him nuts!! On a different note as I am myself a very hyper sort of soul, so lately I have been trying to incorporate some yoga in my workout and I am feeling a lot better! Atleast it keeps me calm through half of the day and I work like a normal person but after that as soon as the yoga effect wears off, I am myself – stressed, trying to juggle hundred of things at once and then failing at them miserably at the same time! Every. Single.Day. How do you guys keep your stress levels in check?! I would love to know how do you manage your lives/work effectively? But in those days, I have this delicious RISOTTO that is the creamiest, best tasting risotto ever! 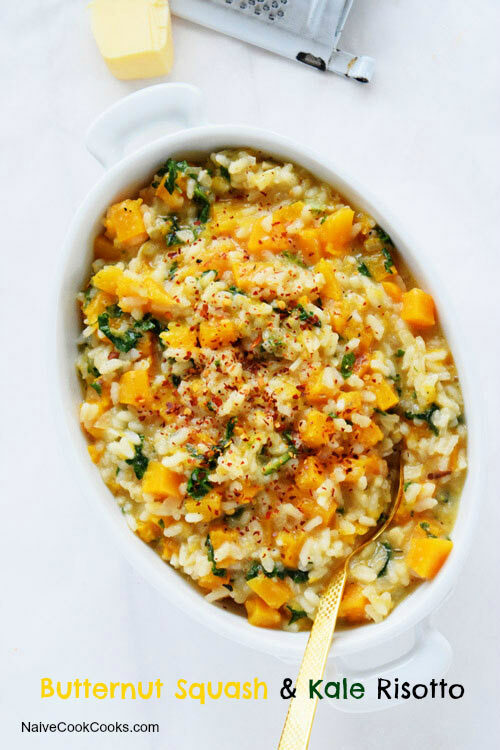 Buttery caramelised squash, finely chopped kale, wine & stock cooked rice, few spices and cheese is what turns this into a delicious comforting meal.And now time for a big glass of wine + this ??? **Make sure you keep the gas on medium to medium-low. **I like to add a good amount of red chili flakes at the end for a little kick. But that's totally optional. This looks amazing!! I’m all about the fall flavors right now so I love the butternut in there. Yum! This risotto is just gorgeous, Ami! This is one of my favorite comfort foods, so I’m loving the addition of squash and kale. Sounds perfect! This sounds amazing! And the colors are beautiful! now that is one comforting fall meal! yum! I would love to have a bite of it. I love making risotto at home, especially during Autumn, as it’s such a comforting, flavoursome dish to make! This looks amazing Ami! 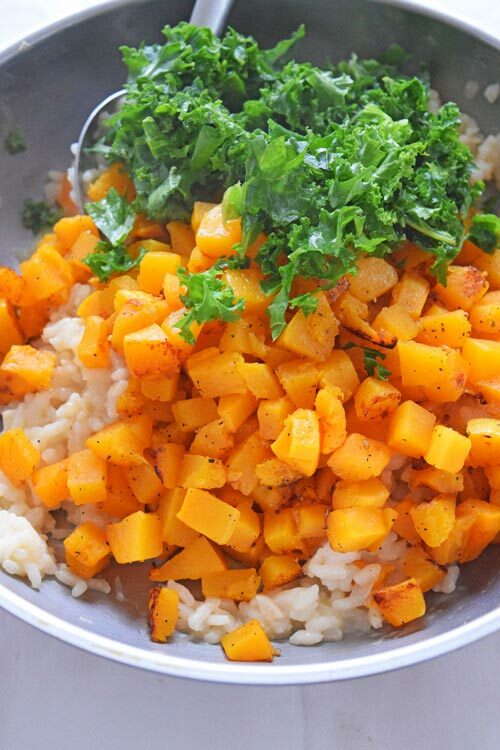 I love the combination of Butternut Squash and Kale. They’re two of my favourite veggies! 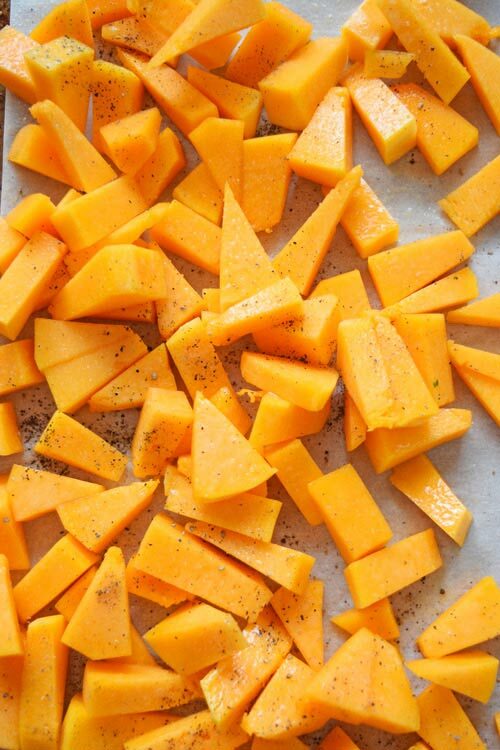 I’ve actualy never had butternut squash, but I just saw this recipe on pinterest and it looks amazing! Now I have to try it! I made it with kabocha, since there’s no butternut squash where I live. Really good recipe! Thank you so much Bia for letting me know that you enjoyed this 🙂 Hope you try other recipes! Excellent recipe! It was perfect accompaniment to our date night with mustard herb crusted tenderloin. It will definitely be staple in our dinner routine. My friend made this for me last year and shared the recipe. It’s become my go-to fall dish and have made it probably 15 times since. So so good.